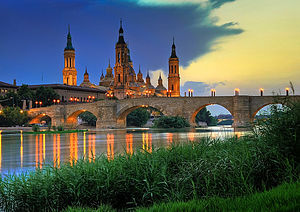 Zaragoza is a pleasant city to live in, great people. It’s not too big a city, more or less has 675,000 inhabitants. Its great location twixt Madrid and Barcelona, ​​Bilbao and Valencia, making it a meeting point for many activities of all kinds: congresses and national and international exhibitions, sporting, artistic and scientific meetings, festivals, fairs, concerts, etc. . Its service offerings Zaragoza makes a very attractive city for visitors, who can enjoy a variety of shopping, dining and entertainment areas. • Registration fee for each course: € 216 (includes tuition, materials used in the classes and certificate of attendance). • Before the start of each course, students will take a test for distribution in their respective language level (from introductory to advanced level).